Welcome to Cape May, New Jersey! Cape May has just been voted by the TripAdvisor 2011 Travelers' Choice Best Beach Award as the #2 ranked beach in the U.S. and the #9 ranked beach throughout the world!!! Welcome to our website! My family and I have been heading to Cape May, NJ for a few decades now, so we figured we would create this site to provide some helpful insight. We’ll provide some reviews, notes, photos, and places to go. If you can't find what you're looking for, or would like to submit a comment of your own, contact us and we'll put it on the site. This great shore town is located within Cape May County, New Jersey. The town offers beauty everywhere from the beaches, shopping, restaurants, bed and breakfasts, hotels, sunsets, horse and carriage rides, victorian homes, dolphin watching, fishing, to the quaint small town feel. We'll touch on all of the topics and much, much more! The surrounding areas of the Point and West Cape May, will be covered too. If you're ever curious where something may be...take a visit to the town map. We hope you enjoy this site! Did you know that it's recognized by the United States government as the nation's oldest seaside resort? And that it was recognized by the Travel Channel as one of America's top 10 beaches! Also, its abundance of Victorian-era homes makes it the 2nd largest collection of victorian homes in the nation, only to have San Francisco recognized as the largest. Oh, and it is the southern most point in New Jersey and a hub for bird watching! And what about the fine restaurants? My own personal opinion, probably the best dining along the entire New Jersey shoreline! Many shore towns all across the country offer the standard touristy, gimmicky, local restaurants. Don't worry they're all around too! But they also offer an abundance of fine dining restaurants that you may have to travel all the way to a 'big city' to find. Worried about finding a place to stay? Don't be! The town is known for its Bed and Breakfast places! Not your cup of tea? Well, there are plenty of other lodging options including weekly cottage/house rentals, hotels, motels, and everything else. So go ahead, click around and have fun with this site! Cape May Point State Park - Information on what the park offers, including the lighthouse, sightseeing, walking, and the beach. 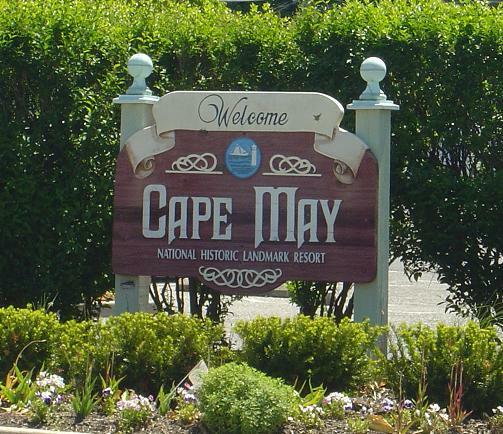 The Cape May Blog keeps you up-to-date with all additions and changes to the capemay4u.com Web site. Subscribe here.